The Assam BJP unit filed a police complaint against Independent candidate for Guwahati parliamentary seat Upamanyu Hazarika and accused him of trespassing into one of their election offices and stealing important items from there. 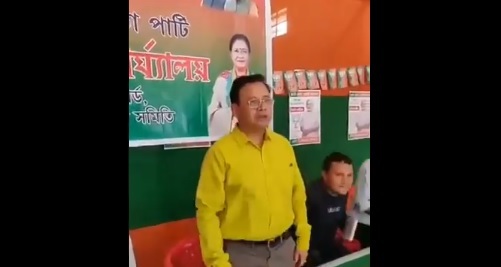 Hazarika, a senior advocate of the Supreme Court and the convener of an anti-influx group Prabajan Virodhi Manch was seen campaigning at an ‘empty’ BJP office opened for election purpose in the city on Saturday. BJP convener Benudhar Nath filed a complaint after a video of Hazarika’s campaigning went viral on social media. Nath stated in his complaint that when the party office bearers went to have lunch, Hazarika entered the BJP office at No 48 Ward under Dispur Mandal Samiti with the sole intention of causing disturbance. He also stated that the officials later found that papers, pamphlets, banners and other election-related valuable items had gone missing. The Independent candidate, who has been campaigning across Guwahati Lok Sabha constituency on foot along with several of his supporters, distributed leaflets among the voters seeking support in the ensuing parliamentary polls. Hazarika alleged that like the empty office, which he happened to discover during his election campaign, the tall promises of the ruling Bharatiya Janata Party (BJP) are also ’empty’. “Just like this empty office, the promises of the BJP are also empty,” he said in the video. According to information, Hazarika also campaigned in Noonmati area where he distributed leaflets containing his agenda. Hazarika has promised to raise his voice in the Lok Sabha for his demand to make 1951 the base year for identification of foreigners who entered Assam, protect the rights of the indigenous people of Assam by providing job security, land rights to the indigenous people of the state. Prabrajan Virodhi Manch convener Hazarika also alleged that the BJP has betrayed the people of Assam which would not happen in his case.